Digital Image. Studio Six Branding. Web 22 November 2015. The campus has recently begun changing the dorm’s traditional shower heads to low-flow and are continuing this change all over campus. These new shower heads decrease the flow rate of water, from 2.5 GPM to 1.5 GPM resulting in less aggregate use. According to numerous online reports from the American Standard Bathroom Habits survey and Moen Plumbing Supply shower study, the average time Americans spend showering each session is approximately 7-10 minutes. This would result in a total yearly consumption of 5,250 gallons per person when using a traditional shower head, and 3,150 if you were to transition to low-flow. The drastic per person difference in consumption can be felt immediately at the expense of anything as low as $10-$50 for a simple low-flow head. DePalma, Nora. “American Standard Press: American Standard Bathroom Habits Survey Shows We’re Multitasking, Even In the Bath.” American Standard – US. American Standard, 20 Aug. 2008. Web. 14 Dec. 2015. 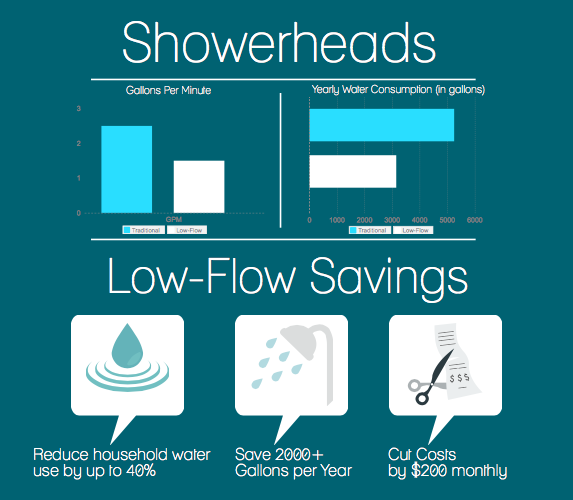 “Low-GPM Shower Heads: Water Conservation Statistics.” Low Flow Showerheads. 2012. Web. 14 Dec. 2015.